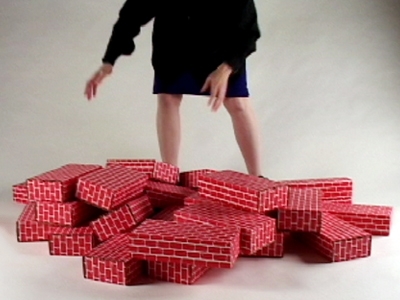 For approximately twenty minutes, the viewer can observe my process of trial and error, as I struggle to construct something with large red toy bricks. Ultimately, I succeed in building a useful structure — or so it seems! In my mind, this video is a metaphor for the many challenges that we face in life, especially in the realm of creativity. This video was featured in the 2012 exhibition, Ups and Downs.